Hypertension, or high blood pressure, affects at least one in three adults in North America and many other developed countries. Even more alarmingly, it is afflicting an increasing number of young people, some as young as 12 years old. So it's not surprising that hypertension medications are among the 10 most frequently prescribed drugs. Myth 1: High blood pressure increases your risk of heart attack and stroke. In other words, if your blood pressure is normally around 120/80 and rises to 140/90 your risk of heart problems is about the same as that of someone whose blood pressure increases from 140/90 to 160/90. It also means that if your blood pressure is a steady 160/90 and shows no sign of rising, it is not a sign of impending heart disease without other risk factors involved. Myth 2: "Normal", healthy blood pressure is in the range of 120/70. Pressure above 130/80 is either high blood pressure or "pre-hypertension". What is normal? For a long time the medical standard for high blood pressure was considered 140/90 and this was further moderated by age. But suddenly the standard was changed. Now some doctors call even 130/80 "high blood pressure" and many others consider it "pre-hypertension". New medications to treat "pre-hypertension" are even underway! The fact is that blood pressure varies widely among healthy people and usually increases with age. Many things can increase blood pressure including over-the-counter and prescription medications, stress and over-indulgence in alcohol. Add to this the fact that blood pressure varies, sometimes significantly, at different times of the day. Then there's the notorious white-coat syndrome whereby the stress of a doctor's visit shows up as high blood pressure while readings taken relaxing at home can be "normal". These examples all go to show that just getting an accurate reading can be difficult enough, let alone setting normal and abnormal levels for a wide range of different people. Myth 3. If you are hypertensive you must severely restrict or eliminate salt (or sodium) from your diet. Not true. Salt is unfairly blamed for causing high blood pressure. Salt, or sodium, is not the culprit. It's an imbalance of sodium, magnesium and potassium in our diet that knocks our blood chemistry out of kilter and thus contributes to hypertension. The problem is that many processed and junk foods are high in salt but deficient in magnesium and potassium. This is compounded when you add table salt to your already salty bacon at breakfast. But the answer is not to become paranoid about salt but to eat whole, natural foods (and you can even take that with a grain of salt!). Grains, vegetables, fruit, meat and fish in their natural state contain more balanced amounts of sodium, magnesium and potassium. Simply eating a healthy diet of whole foods can have a dramatic effect on blood pressure. Hypertension is almost unknown among the few remaining peoples that still eat in this way. Myth 4. Taking blood pressure medications is better than the alternative. Only in a minority of cases and as a last resort! It's no surprise when you hear natural health gurus claim that drugs are worse than the disease. But you really take notice when it's a medical doctor saying it! That's exactly the case when Dr. Lee writes in the same article quoted above: "I don't like anti-hypertensive drugs because their side effects are often worse than the high blood pressure they're prescribed to treat." (his bolding) He goes on to say: "conventional physicians tend to prescribe anti-hypertension drugs any time blood pressure readings fall outside of so-called normal ranges. This is unjustified, and probably does more harm than good in the long run". All categories of blood pressure drugs have side effects and these have been minimized by doctors and the pharmaceutical industry. For example, some hypertension medications can contribute to ischemia whereby tissues are damaged due to insufficient blood supply. Others cause erectile dysfunction. 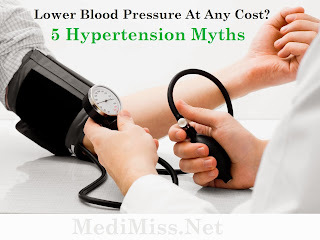 Still others can result in low blood pressure, which has implications just as serious as high blood pressure. These are only some of the potential dangers of blood pressure medication. See Dr. Lee's article for a more complete discussion. Myth 5. Lifestyle changes are not usually enough to reverse high blood pressure. Therefore, prompt drug intervention is advisable. Exactly the opposite is true. The best way to maintain healthy blood pressure is always through lifestyle, including diet and exercise. If you are seriously overweight or out of shape, if you smoke or over-drink, or if you're under severe stress, a positive change in these factors is bound to have a dramatic effect on your blood pressure, regardless of how high it is. The problem is that many doctors have come to believe that their patients are unlikely to make the changes needed. This is one of the reasons they over-prescribe medications or intervene too quickly. It's almost become a preventive measure for them. But the fact is that most people will make the effort to improve their lifestyles if given the right support (and especially if given accurate information about the side effects and dangers of hypertension drugs!). In the rare case in which your blood pressure fails to respond to lifestyle improvements it's time to look beyond the usual suspects such as weight and diet. There are several other areas that are rarely examined but which can wreak havok on your blood pressure. For example, are you suffering from hidden stress? Some people have been chronically stressed for so long they don't even recognize it any longer. It's become their "natural" state. What about your breathing? Yes, your breathing! Often together with high stress, people develop what some experts are calling "inhibitory breathing". It constricts blood vessels by increasing muscle tension and may also unbalance blood chemistry. A new technique called slow breathing with music can do wonders to lower blood pressure through breathing. It just goes to show that there's more to lifestyle than you may think. If you are frustrated that your changes are not making a difference you may need to dig deeper. 1. High blood pressure is a serious condition that demands attention but there's no need to panic, especially if otherwise healthy. A significant and sustained rise in your blood pressure is of much greater concern than the actual numbers themselves. 2. There is a wide range of healthy blood pressure. Watch out for white-coat syndrome and determine your normal blood pressure in a relaxed state. Then watch out for sustained increases from this level. 3. It's not about salt. There are no "evil" or "miracle" foods! Eat a balanced and varied diet of whole, natural foods. A modest magnesium supplement of 300 to 400 mg might not be a bad idea either. 4. If you are healthy and have no other risk factors, take medications only as a last resort. Give lifestyle at least a six-month chance. Don't ignore medical advice but if your doctor is too rigid seek a second opinion. 5. Healthy blood pressure is maintained through lifestyle. If your blood pressure is a problem then something is almost certainly out of whack. Look deeper if you don't find an obvious answer.